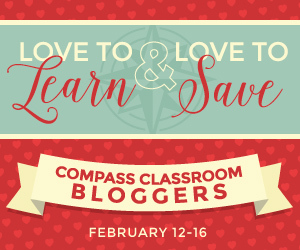 The folks at Compass Classroom are having a great sale on curriculum from today until February 16th! This Love to Learn sale is for a variety of products, but one of their curriculum sets–Modern Parables–you can get at a special deal of 25% off through The Army Chap’s Wife. Modern Parables is a new kind of Bible study. From one perspective, it’s a study that uses short films of the parables to teach the Bible. But from another perspective, it’s something unique. Modern Parables employs a new method of understanding the Bible through films that explain the biblical text. It uses modern stories that recreate in the viewer the same responses that the original audiences of Jesus’ parables might have experienced. We have used Modern Parables in our homeschool, and really enjoyed them! To get 25% off digital or DVD Modern Parables, use the coupon code ARMY25 at checkout. But remember, this code is only valid from 2/12 to 2/16!